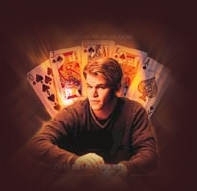 Has anyone else seen that film, Rounders - where this guy's life is all screwed up from playing poker or whatever and losing a bunch of money? Was it poker in that film? I don't really remember. Anyway, playing poker in tournaments is my dad's latest crackhead idea of what to do with the rest of his life. Before this, there was 'playing professional golf' even though he'd never swung a golf thingy in his life (I was thinking 'golf bat' for a minute there, but it might be 'golf club'?) and then there was selling (giving away) all his possessions and building (building?!) a beach hut in Costa Rica. There was the idea of a houseboat on a lake in Oregon. He thought of camping for a couple of years in Northern California, what else was there? I lose track actually. But it is quite difficult to keep track. Just as long as he's happy is what I think (or what I'd like to think) and just as long as he keeps in touch. There have been too many times where my dad just drops off the face of the earth. He's kind of a wandering eccentric, my father. But he tells great stories. Sure, most of them are from his idyllic childhood growing up in a smalltown in the 50s, or his war stories from Vietnam. But my dad is the kind of person who meets weird, weird people. But that's a good thing, right? Phew, this NaBloPoMo is over. I hope I win a prize, cross your fingers for me, OK? Yes I liked that movie...anyway my DAD sounds like your dads best friend! He is a semi-retired bachelor who wants to buy a camper and travel. He is on disability which actually gives him much needed freedom but still has no idea what to do with all the freedom! Well at least he's very positive and keeps busy doing god knows what...sometime I loose track of him and he just POPS up with an email. Yeah we made it through NoBloPoMo! I wish my dad was more relaxed, I mentioned retirement to him once, he looked really hurt and said "but what will I do with myself I don't want to stop working". To me that is sooo insane. I guess we all think ours dads are a little strange.